The J&K Services Selection Board Teaching Vacancies 2018 - Get here latest Jammu and kashmir Service selection board notification for recruitment, download official notice pdf. 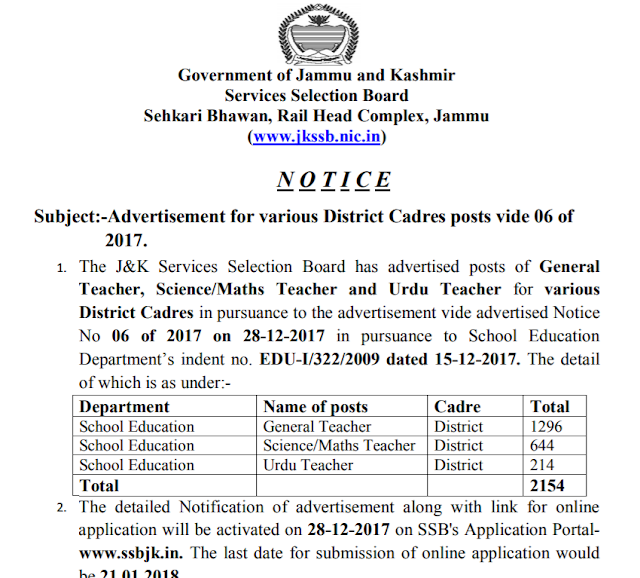 The J&K Services Selection Board has advertised posts of General Teacher, Science/Maths Teacher and Urdu Teacher for various District Cadres.The J&K Services Selection Board has advertised posts of General Teacher, Science/Maths Teacher and Urdu Teacher for various District Cadres in pursuance to the advertisement vide advertised Notice No 06 of 2017 on 28-12-2017 in pursuance to School Education Department’s indent no. EDU-I/322/2009 dated 15-12-2017. The last date for submission of online application would be 21.01.2018. The detailed Notification of advertisement along with link for online application will be activated on 28-12-2017 on SSB's Application Portalwww.ssbjk.in. It is again reiterated that advertisements will be notified and online application will be accepted at www.ssbjk.in only. All the best for The J&K Services Selection Board Teaching Recruitment examination 2018.